The features of our dye circulators are not only their silent operation and possible 24-hour performance, but they are also easy to manage and very reliable. All systems are completely grounded. All dye circulators can be equipped with different dye cells. In the field of laser accessories, Radiant Dyes is in the position to supply quartz glass cell for all dye lasers. The following cells are the most common ones for commercial and custom made dye circulator systems. Other cells made of quartz glass or other optical materials and dye flow cell units not mentioned below can be supplied according to your specifications. Our high quality filter cartridges are one-way filters made of sintered polypropylene with high retention rates of 0,2 μm. On request, filters of other materials such as teflon or different can be supplied. 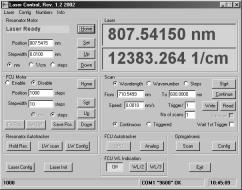 Picture left illustrates the Main window of the Narrowscan Control program. The screen is divided into several sub-windows for ease of use. What windows are available for laser, depends of the configuration of the laser. Sub-windows Resonator Motor, Laser and Scan are usable for every Narrowscan laser, but windows FCU Motor, Autotracker and Optogalvanic are only valid for lasers with FCU unit, Autotracker Unit and Optogalvanic Unit (or Resonator Frequency Stabilization Unit) installed. The top part of the Main window offers pull down menus respectively a Laser menu, a Config (configuration) menu, a Numbers menu and an Info menu. For item Config sub-item Laser is extended. In the right bottom of the Main window are buttons for some common operations – Laser Config, Laser init and Exit. In the status bar, find in the bottom of the Main window, are presented status of the used serial (RS-232) port, last string received from a laser controller (left area of the status bar) and clock in the right end of the status bar.